As I mentioned before both of my kiddos have eczema. This means that what kind of laundry detergent I use is extremely important because for the detergent I can only use free clear brands to ensure it won’t cause my babies to break out. Up until now I had a hard time because only a few brands offered free clear and it was normally pretty pricey. So I jumped up and down when I found out I would be able to review the Purex complete with Zout–Free Clear kind! A stain remover plus free clear???!!! Hurray! I just got done doing all my laundry with it (see it’s on the nice clean clothes above!) I’m super duper happy with it! I hadn’t noticed till *after* I washed the clothes that for stains it suggests that you can even use it to pre-treat them by rubbing it directly on, very cool! I will have to try that next time. With Tyler eating solids now all his clothes pretty much need the stain remover treatment! At only $3.49-$7.99 (my bottle is *big* too) I can say that I will most definitely be purchasing this to do my laundry from now on! If you don’t need to worry about babies with skin problems the detergent also comes in Fresh Morning Burst–which I’m sure smells awesome if it’s anything like the Purex Crystals! Want to try it for yourself? You can go to FreeSamplePurex.com and prove it to yourself with a free sample! Two Lucky Winner’s Will Receive A Bottle of Purex Complete With Zout! As always be sure I have a way to get your email address so I can tell you that you won! If I don’t have an easy way to get it (in your comment, google profile, etc) I will automatically choose a new winner. A new winner will also automatically be chosen if any of the entries are not followed specifically (such as doing the mandatory entry). Also leave a separate comment for each additional entry that you do! One comment = one entry! Open to the US only and 18 years or older. 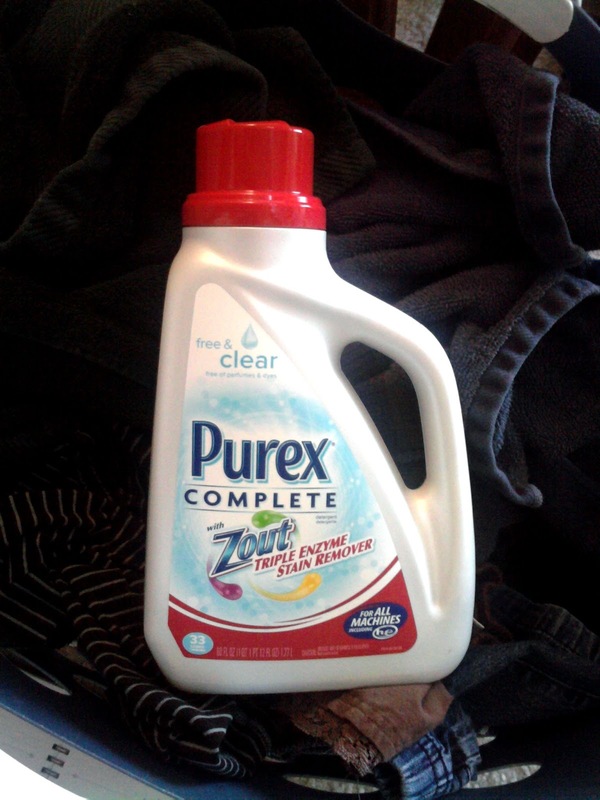 Tell me have you ever tried Purex before? Because who doesn’t need good detergent?! 1 Entry ~ Snag my blog button, isn’t it cute?! Leave me the url so I can come visit your blog! 1 Entry ~ Blog about this and be sure to link back to this post, leave me the URL to the post, you know you wanna share the love! I will choose the winner via random.org contact them via email and post them on this blog. They have 48 hours to claim their win before a new winner is chosen. I currently use the 3 in 1 sheets. Yes, I have used purex quite often. I am planning on doing laundry today- I have been out with the flu for the last 2 weeks, so you can imagine how much laundry I have. We use Purex all the time, but usually opt for their Free and Clear. Wow, talk about a popular giveaway lol. Actually, I just tried Purex for the first time a few weeks ago. It was just $5, so thought “Why not?” and I am super impressed! I currently have a load in the washer (it’s my morning chore each day). No, I don’t think I’ve tried Purex before. I did a load of laundry and folded it just a little while ago. Yes I have tried Purex products and love them. Just started a load of laundry. I was just about to go start a laundry load anyways…I always throw one in the washer last thing at night so its ready for the dryer come morning so I can get an early start at it. I’ve used several Purex products. I think I may have used Purex years ago, but it has been too long to remember for sure. I’ve used Purex, but it was many, many, many moons ago!! I just got done washing my bedding thanks to my cat getting sick under my covers! I use Purex all the time. I have Purex at my washing machine right now! Yes, I have used it at times before, usually when it was on sale and/or I had a coupon. I just finished folding the last load for this week before I sat down at the computer!